Trip reports on adventures in Kayaking, Scuba, Caving, Packrafting, Hiking, Bike riding, Rock climbing and anything else I do. Most of these include some connection to swimming or water in general thus the connection to Otters. 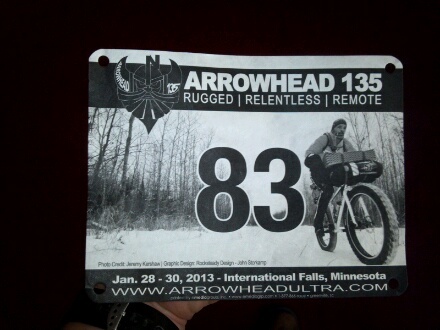 They told me the Arrowhead 135 is hard and only the strongest should even speak it's name. They tell me it's on the FBI list of suspected serial killers and some even say it's route follows the property lines held by Satan himself. I found that hard to believe but with ice on my knee, I walked the land in the shadow of hell. Last year I went camping with some guys and one of them was The Legend, 2 time winner and current director of the Arrowhead. I was totally green to adventure races and organized endurance sports. I've done many but it's been two men and a plan, like climb the Exum Ridge of the Grand Tetons. Nothing with a starting gun but I see the appeal so I think about my questions and try to limit the chatter. I ask, "How do you race that far?" He says, pick a pace you can go at all day and then do that all day. I race in some 100 mile gravel rides and learn some lessons about how right The Legend was. I have lots of experiences to draw on from rock climbing to kayaking to wilderness cross country skiing. I can manage stress from scuba diving in near zero vis to winter camping at -10. I don't know how to put it all together but I open my mouth and tell The Legend "Someday I'd like to try the Arrowhead"
I do it again when registration opens back in October but this time to the veteran racer and I send in the application. They don't let just anyone in. They want to know you can handle yourself when things get serious. I get one of the few spots left when Josh calls The Legend and says I have the metal it takes. I'm not sure but I'm excited to be in. I start training but I know from other things that I need to get my head in the game and that as long as I do what is needed I'll do fine. I am a hammer head. That's bike slang for someone that wants to go flat out all the time. It's great fun in summer sprints and criterium races and harmless failure in gravel races but in a wilderness ultra marathon it's dangerous. I train that out of me with hours of slow riding. So with all that history out of the way, I'm freaked out about what I've got myself into. I've talked the talk and last Monday I needed to walk the walk. As the snow fell the walk was literal but I'll get to that. I take the line at 7am with 138 others and I'm just going to turn the brain off because I don't know what to think so it's not going to help. Something I'll fight with for hours. The line is casual because back a few rows from the front everyone is ready to ride for 20+ hours and the race is not won at the start or even at hour 10 so people are ready to go but reserved. Races start with a blast of energy, reserved but still chaotic, and it's the best and worst at the same time. Your brain is scrambling to process the information your eyes and ears are feeding you. All critical pieces of information to keep you from crashing and getting hurt in the bull run that's all around you. Below is my helm. Mittens, Glove box, Feed bag, Speedometer/Odometer, and center console. The blue dot on the left is the lid of my required 3000 calories in the form of Skippy Peanut Butter in a bottle holder. The race is a few hours old and the mass of bulls has stretched into a thin strand of panting dogs from the soft trail. Mild temps make the outdoors pleasant but the snow isn't frozen into the hard pack we need for easy riding. Ruts and mush dominate for the first 35 miles and takes just less then 5 hours. I come into Gateway checkpoint and the anxiety of not knowing what I've gotten into is clear. It's hell and it's just started. I tried to turn the brain off but the struggle to stay riding in the mushy trail makes that impossible. I'm thinking the entire time, mostly about physical limits. Without any serious consideration I head out from Gateway. Emotionally I'm weak and know it so I get back on the trail after getting more water. Not long after Gateway my wife meets me at one for the few road crossing and gets this picture. Things improved and the trail is a bit firmer but still slower then we'd like. I manage 7 mph to this point. Knowing I need to do some show and tell I take a lot of these so you can share in the scenery. Around mile 70 I cross Elephant Lake and the midway point. The last 35 miles went fast as trail conditions got better and I was pleased to be half way in about 10 hours. I hope to be done in 10 or 11 more hours. I eat 2 grilled cheese and refill water and leave before I get lazy. It's about 5pm Monday and I want to keep moving. The snow and sleet started a few hours after I left Melgeorge and slowed my progress as well as everyone else to a crawl and by midnight I was passing lots of people bedding in for the night. Part of the required gear is bivi gear (-20 sleeping bag, pad and tent). I call the wife and tell her I'm going to bivi and that she should go to the hotel because I'm 12 miles from the checkpoint and 37 from the finish. I walk about 45 minutes and find a large fir tree with a high skirt and good canopy to hide from the snow. It takes me 10 minutes to stomp a platform, set up and crawl in. I'm wet from snow melting on me as well as sweat. I pull off the boots and jacket. Hide the boots under a bag but let the jacket freeze and crawl in my -25 down bag with the remaining wet clothes. This is where experience and proper clothes pay off. I know the clothes will dry while I sleep as the heat pushes the water out of the poly and the down bag will do all the work. I wake, dry but have to crawl out of a warm bag and push a bike through 8 inches of fresh snow for the next 5 hours. Hours and hours of pushing my 55 pound bike up and down hills breaks me. I'm only getting by on the last words I made public. "Only the grimmest will I quit". I'm trying to reconcile if this is grim or just awful. I haven't been able to get out of my head the entire ride and the snow is killing me. About 10am I get a text (I turned the phone on to tell my wife I was up and moving) from Josh asking if I'm still riding and I text that I've been pushing for 3 hours and at my limit and I'm thinking of going DNF. The phone rings shortly after with a very stern message that I am not to quit, no matter what. It was quitter vaccine and I was inoculated after that call the only words stuck in my head was Josh reminding me , "DON'T YOU F'N QUIT". I push for 2 more hours to Ski Pulk, have two cups of hot coco and head out for the last 25 miles. The last 40 miles have taken 18 hours (7 sleeping). The last leg was hard but I could at least ride long stretches at maybe 4mph broken by short pushes that I now welcome the pain of riding. My legs are giving out and the punishing is breaking me physically but my spirits are good because I know I'll finish even if I have to push; I'm under 12 miles and I've done that in 5 hours so it's a done deal. Almost at the end I take some of the final set up shots. This is mile 130. About 4pm Tuesday or 33 hours and 135 miles from the nervous bull run I cross the finish. The Arrowhead isn't as hard as they say, it's as hard as you say. I've only done it once but I get it. It's just like it says, Rugged, Relentless, Remote but the real challenge is it throws everything at everyone for hours on end and you'll eventually cross the border into your own hell. In a race where more then half dropped out you have to be following the property lines held by Satan himself and on that note I have a lot of very smelly laundry to wash.
Nice job, and way to suffer!! Great stuff! Good to read this as I'm preparing for Rovaniemi 150. Way to finish it Steve. Congrats! Great report. I'm thinking about this in 2014 so I'm tryin' to soak up all the knowledge I can. Thanks.